No amount of preparation or a lead single for “This Heaven” could have prepared me for this. Angry goths and even angrier college rock Program Directors is what I remember most when I think back to the return of Love and Rockets in 1994. Ash’s solo albums hadn’t given any hints and J’s solo work was even further afield to what wound up comprising this album. To this day, I still have no idea what Kevin Haskins was up to before the band re-convened to put this out. He played a bit on Ash’s solo debut ‘Coming Down’ but aside from this, even the liner notes couldn’t reveal his position. This band had gone silent, dead still, in the wake of the unexpected chart topper “So Alive”. Wisely, they chose to stay dormant until the storm blew over. How they chose this route is a mystery even now, nearly twenty years later. Surely there were meetings, some kind of airing of grievances or perhaps they just found their respective muses again. Regardless, as 1993 burned down, I picked up the ‘Deafening Divinities with Aural Affinities’ compilation which Beggar’s Banquet put out and my world turned upside down. 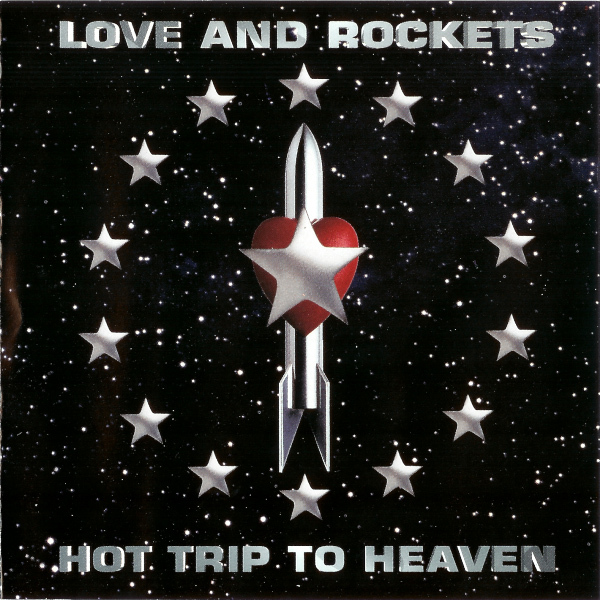 Buried amongst acts like The Nefilim and Terminal Power Company, Love and Rockets appeared out of nowhere with a song which sounded nothing like them. They’d gone to the club, or so it seemed. Because even though the beats and effects were static, they wove their own signature sounds around them with delicate grace. You could almost hear the crystal glasses humming while they moved through the shop stealthily. None of this deterred our three heroes, who bravely rolled with the punches and upped the bar by neither touring or granting many interviews. This was a baffling, monolithic landmine placed in the middle of the road which led to success. They didn’t care if you got it, or liked it, or even understood why they’d done it. To me, it was the perfect bridge between what had come before and where they were now headed. They had achieved the unthinkable: an electronically based album which oozed with emotion, a soulful meltdown which didn’t ever let up. Love and Rockets were hardly confined to being a three-piece “alt-rock” band, this outfit were on a mission well beyond the dark side of that moon. They’d had their holiday, here was the report on what had been discovered and how they’d evolved. Whatever it was that shook them up, be it their brief time in the limelight or just boredom after four albums of a particular style, the results were fantastic. To all the fans who turned their backs I could only keep repeating: this is still Love and Rockets. All you had to do was listen up closely and their unique sound came bleeding through the statically charged atmospheres without losing any potency. J’s bass blended in seamlessly while Ash’s pyrotechnic guitar work shook up these songs like a thunder storm rolling over the land; even though those beats were mechanical, some classic Haskins touches pervade them. Go listen to “Trip and Glide” if you’d like to know more. Lyrically, as always, Daniel’s words were more personal yet also detached in a very abstract kind of way. David J kept his thoughtfully insightful, preferring to focus on the state of the world and the swirling eddy’s which make up populist opinion. And while the musical landscape capitulated to the darkness of grunge here in the states and the nastiness of guitar riddled “industrial” in Europe, the trio who billed themselves as being uniquely different maintained their ethos. They chased no fads nor did they experiment with the trends of that time. Their singles were loaded with techno and house remixes that drove the purists even crazier, something they appeared to revel in. The single for “Body and Soul” has a b-side on it called “Coyote” which is a middle finger to expectations on an incalculable scale. This is something else which they managed to bring to their work which hadn’t been there before, a sense of scale. They wanted this record to be daunting and it was, and is. David J: RCA did not get it and let us go. Rick Rubin on the other hand dug it & consequently we signed to his label, American Recordings. In 1995, the last works from this era appeared on an EP which was titled ‘The Glittering Darkness’. If people had loathed their transformation before, this one filled them with a white-hot rage. More disparately constructed songs, more effects, more reverb, more atmospheres and even less explanation. Call it what you will but this little jewel goes the distance, despite the inclusion of one of their songs for ‘Sweet FA’. Just skip it and you’re right back in limbo; what Mr. Wonka would say is beneath his factory. Minusland, truly. They just kept pushing at the boundaries and rather than ignoring the margins, Love and Rockets made them the focal point. I really miss these guys, maybe it’s a generational thing but for me Bauhaus never could hold a candle to what this group did. Thanks for the memories.